Wittenborg Online: Wittenborg to Bring Affordable Private Education to Amsterdam, Combining Entrepreneurship with Structured Education says New Dean in BNR NieuwsRadio Interview. From September 2015 Wittenborg University will offer its IBA in Entrepreneurship & Small Business at its brand new location in Amsterdam, bringing affordable private education to the city in an ideal learning environment which combines innovation with structured education. So says the Dean of Wittenborg Amsterdam, Timo Timmerman, who fielded questions on BNR NieuwsRadio this week about what distinguishes Wittenborg’s programme from other similar business training programmes in the city. According to him now is also the ideal time for young start-ups to be based in Amsterdam as a city already bustling with young entrepreneurs and eager to attract and retain more. “There is however a need for structured entrepreneurship directed education combined with the practicalities and creative freedom to start your own business. We see more and more young people who want to do that and the city of Amsterdam stimulates that,” Timmerman told BNR. The emphasis of the Amsterdam version of the IBA programme will be on entrepreneurship with minors in Family Business, Corporate Entrepreneurship, Sales and Branding. Wittenborg University’s headquarters is in Apeldoorn where it provides education to international students from more than 50 different nationalities. It is expected that the new programme will attract an estimated 300 students by 2018. 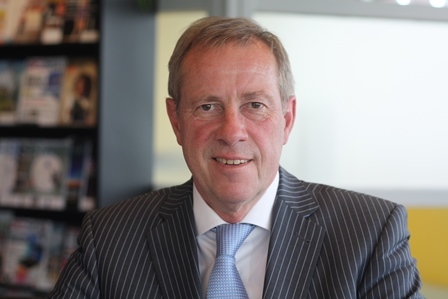 Timmerman, who is the former founder and owner of the New Business School Amsterdam and until recently director of Nyenrode NBS brings a wealth of experience and contacts from both the business world and education sector to his new job at Wittenborg. “Thanks to the international character of the education and the diversity of both students and staff, this entirely English-taught programme is also very appealing to Dutch students who want to start their own business and have international ambitions.” Wittenborg’s unique education model provides the opportunity for students to start with the programme at 6 different entry dates per year, which means they also have 6 different opportunities to graduate. Its small size ensures students enjoy personal attention for the duration of their studies while at the same time it boasts a School of Business and Hospitality with Schools of Health, Art and Technology as well as Education are planned for the future. Timmerman told BNR Wittenborg students in Amsterdam will have the opportunity to study as well as work abroad during the course of their training. In fact, Wittenborg recently sealed an agreement with the biggest NGO in the Philippines, Gawad Kalinga, who offers volunteer and social entrepreneurship possibilities to students. Wittenborg also has partnerships with institutes in Britain, France, Spain and Germany as well as China. He says he believes students will strike the balance between work and studies easily. “If you work on something you have a lot of passion for than it is easy to work through the theory.